In the brave new world of distributed version control, history is no longer linear. It can branch freely, under no central control. But what is perhaps more interesting is that you can merge disparate branches back together. This makes it much easier to do long-term feature work, because it is possible to track a moving target. For the ActionMonkey project, we are following a procedure where all changes are reviewed before they are pushed to the actionmonkey branch. This means that we won’t have a huge blob of changes that need review before they are integrated into mozilla-central. This creates a new class of problem: how do you perform merges? Is it necessary to review merge changesets with the same rigor as regular changes? How would one actually go about reviewing a merge changeset? 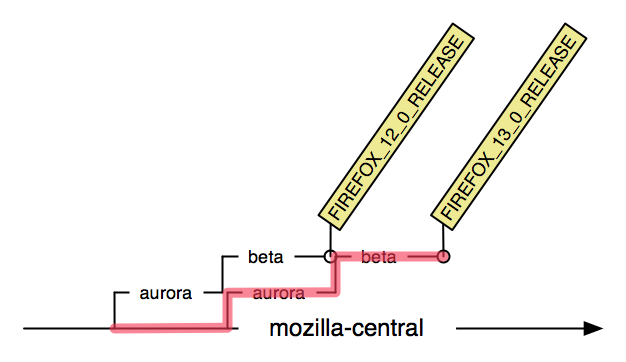 It isn’t hard to diff this changeset against its mozilla-central parent, or against its actionmonkey parent. But neither of these diffs give you a sense of the real work involved in the merge. What I really want to give to Jason is a static view of a three-way merge as it already happened, highlighting the source locations where I made conflict resolutions or manual changes. Does anyone know if such a tool exists for Mercurial, or for any other distributed version control system? Because I don’t know of a tool like this, I did the next-best thing: in my checkin comment, I carefully listed every file and function where I made a conflict resolution or manual change. This will at least make it clear in the future where I may have goofed. I now have unrelated changes in GC.cpp that I’d like to separate. Dear lazyweb, is there a tool I can use to interactively separate out these changes into two changesets? The solution should work with my mercurial workflow, no “use git-rebase” comments please. I happen to be using patch queues, but a solution that worked on real mercurial changesets or on raw patches would also be acceptable. It happens that usually the patch hunks for problem X and problem Y are completely separate, so a simple tool that let me throw “this hunk for X, this hunk for Y” would probably be ok. Better would be something like a three-way merge tool where I can edit an intermediate state between a fixed start-point and end-point. You are currently browing the archives of posts tagged with 'mercurial'.